It is a common belief that desserts don’t go hand in hand with health. For everywhere you turn and every health magazine you flip, the first and the last thing that is brought to your focus is how to cut down on your desserts to maximize your health and minimize your body fat. The world has come to this stage that almost all love handles, all jiggling bellies, all triple chins and flapping batwings are credited to these otherwise tongue tingling delights. Fresh Yogurt Mango Delight – Take 2 cups of thick low fat yogurt, 2 sweet ripe mangoes (one diced), 1/4th cup roasted almonds chopped and sugar to taste. Add all the ingredients other than the chopped mangoes to a blender and blend till smooth. Pour a half of the content in a flat base container. Add the diced mangoes to form a layer and then add the other half of the content. Sprinkle the chopped roasted almonds, chill and enjoy! Apple and Peanut Butter – This is more of a sweet snack than dessert. However, when served with innovation, this could be a simple yet delightful dessert. For this, all you will have to do is cut the apples into slices with medium thickness and apply a thin layer of peanut butter. The latter is rich in protein content while apples hardly carry any calories! Egg White Pudding – Take ½ liter of milk and bring it to a boil so that it lowers in level in the pan by a notch. Bring it out of the flame and add 4 egg whites and low calorie sugar (required quantity for taste). Add a teaspoon of vanilla essence to the mixture and cook in the microwave for 10 to 12 minutes or till an inserted knife comes out clean. The dessert may take a little over ten minutes to prepare but it is any time lesser than other typical desserts. Cottage Cheese Protein Packed Pancakes – This is one of those recipes that all those willing and wishing for a great body must try. 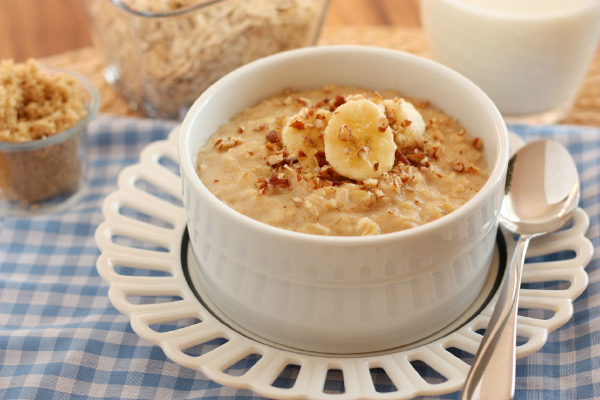 The ingredients include 1 cup cottage cheese, 1 cup oats, 1 banana, 4 egg whites and 2 teaspoons vanilla essence. Mix all ingredients and blend into a smooth paste. Cook it in a non stick pan like how pancakes are generally cooked. You can top these pancakes with a moderate helping of peanut butter or honey and enjoy! Turn to the Box – Last but never the least, when all else fails your cooking skills, try turning to the box available in dependable stores and under dependable labels. Today, there are a few brands that still have protein rich snacks available in packed form without the excesses that generally accompany packed foods. Choose wisely and live well.